Fidel CASTRO led a rebel army to victory in 1959; his iron rule has held the country together since. Cuba's communist revolution, with Soviet support, was exported throughout Latin America and Africa during the 1960s, 70s, and 80s. The country is now slowly recovering from a severe economic recession in 1990, following the withdrawal of former Soviet subsidies, worth $4 billion to $6 billion annually. Havana portrays its difficulties as the result of the US embargo in place since 1961. Illicit migration to the US - using homemade rafts, alien smugglers, or falsified visas - is a continuing problem. 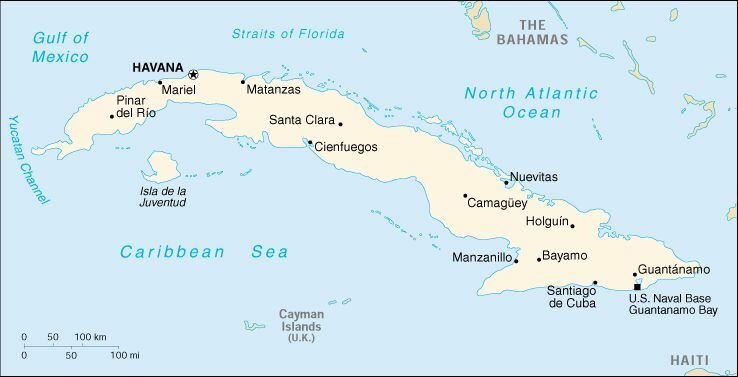 Some 3,000 Cubans took to the Straits of Florida in 2000; the US Coast Guard interdicted only about 35% of these. The government, the primary player in the economy, has undertaken limited reforms in recent years to stem excess liquidity, increase enterprise efficiency, and alleviate serious shortages of food, consumer goods, and services, but prioritizing of political control makes extensive reforms unlikely. Living standards for the average Cuban, without access to dollars, remain at a depressed level compared with 1990. The liberalized farmers' markets introduced in 1994, sell above-quota production at market prices, expand legal consumption alternatives, and reduce black market prices. Income taxes and increased regulations introduced since 1996 have sharply reduced the number of legally self-employed from a high of 208,000 in January 1996. Havana announced in 1995 that GDP declined by 35% during 1989-93 as a result of lost Soviet aid and domestic inefficiencies. The slide in GDP came to a halt in 1994 when Cuba reported growth in GDP of 0.7%. Cuba reported that GDP increased by 2.5% in 1995 and 7.8% in 1996, before slowing down in 1997 and 1998 to 2.5% and 1.2% respectively. Growth recovered with a 6.2% increase in GDP in 1999 and a 5.6% increase in 2000. Much of Cuba's recovery can be attributed to tourism revenues and foreign investment. Growth in 2001 should continue at the same level as the government balances the need for economic loosening against its concern for firm political control.